Harry L. Smith. Memoirs of an Ambulance Company Officer. Chapters 9-10. THE 4th DIVISION AS A UNIT OF THE 3rd ARMY Corps under Lieutenant-General Robert Lee Bullard was in the thick of the Meuse-Argonne campaign. It fought in that offensive for 24 days, the longest consecutive period that any division of the American Expeditionary Forces remained in action at the front. The division lost 1,120 soldiers and 45 officers in those 24 days, and 6,048 other soldiers and 199 officers were wounded, gassed or reported missing. In all, our division suffered a total loss of strength of 7,459 officers and men. But there was much to be said for the prowess of the 4th Division. It penetrated 13 kilometers of the densest, most desolate sort of terrain, took no less than 2,371 German prisoners, 57 field guns, 4 minenwerfer, 288 machine guns and 2 tanks, in addition to huge stores of ammunition which the enemy desperately needed at this stage of the war. The division, less its artillery brigade and ammunition train, was withdrawn from the battle lines on October 24, 1918. The 4th Artillery Brigade continued in active service to the signing of the Armistice. No one could spare the artilleryman in those days. The plan for the Meuse-Argonne campaign had been agreed on at a conference at Bombon on September 2, in which Foch, Pershing and Pétain took part. At this conference Foch reverted doggedly to his objective of breaking up the American army. He wished to split up in such a manner as to send its most seasoned soldiers to the 2nd and 3rd French Armies, under French commanders, of course. Pershing refused to accede to such a plan of dismemberment, and the conference proceeded. Saint Mihiel had been designated as Operation A of the Meuse-Argonne offensive. 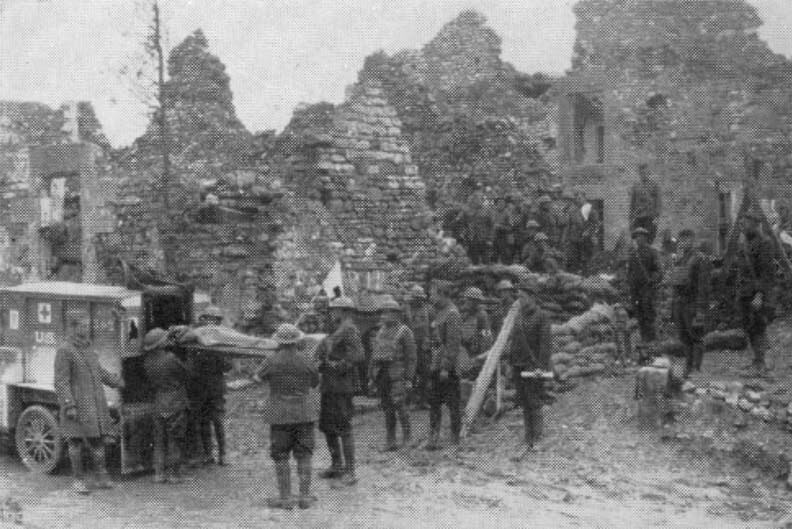 The American army's drive in the Meuse-Argonne sector proper was Operation B. A French attack extending west from the Argonne Forest to the River Suippe was to be Operation C. Operations B and C were to be initiated simultaneously. Later, the French 4th Army was to continue the attack west from Rheims to the River Aisne, as Operation D.
It was the job of the 1st American Army, of which the 4th Division was a part, to smash the Hindenburg line on the front Brieulles-sur-Meuse to Romagne-sous-Montfaucon, to Grandpré. The French lent the Americans 180 airplanes, 239 tanks, 1,002 heavy field guns, 456 light field guns, 254 trench mortars and a division of cavalry which was to stand by in the event of a break-through by the Americans. The task that lay ahead was inconceivably hard. The ground was wholly unknown to the Americans, whereas the Germans had occupied it for years. They knew every hill and thicket, every spring or freshet, every natural vantage point in addition to the ones they themselves had constructed. Moreover, several divisions of the 1st American Army were composed of green, untried men. Vauquois, a fortified hill held by the Germans, was thought to be almost impregnable. 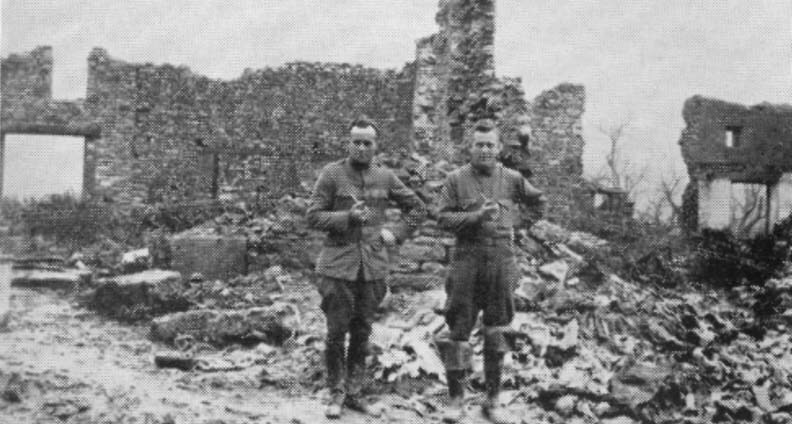 Montfaucon, from which the Crown Prince of Germany had looked down upon his men as they stormed Verdun in 1915, and which for several years was his official headquarters, was considered to be nearly as strongly built as Vauquois. Not all the advantages lay with the enemy. At the beginning of the assault the Germans had only 5 divisions in the line. Four of these were composed of second-rate troops and the 5th was a Guards division that had been much battered and had been sent to the sector for a rest. Only one of the German reserve divisions immediately behind the lines was a first class unit. Far to the West, facing Haig and his 40 British and 2 American divisions were 57 German divisions. Facing Gouraud and Pershing, with their equivalent of 60 divisions, were only 20 German divisions. In other words, the Franco-American forces in the Meuse-Argonne outnumbered the enemy nearly 3 to 1. Because Pershing cleverly sent reconnoitering parties and a few tanks to make thrusts at the German lines east of the River Moselle and south of the Vosges Mountains, thus drawing attention from the sector the American forces were in, the attack in the Meuse-Argonne came as a complete surprise to the high command of the enemy. On the night of September 25, the 7th Brigade of the 4th Division moved silently into trenches north of and around Hill 304, north of the town of Esnes. The 8th Brigade was held in reserve. In front of the men in line was the valley of the Forges Brook; across the valley were the German troops. Churned-up earth, blasted, jagged fragments of trees and a great maze of black and rusted barb wire were all that could be seen in that dismal region. At 2:30 on the morning of September 26, with the entire countryside shrouded in deep fog, a monstrous barrage was loosed, lighting up the foreboding skies with gigantic flashes of red and orange and shattering the air for miles with tremendous thunderclaps of giant rage. At 5:30 the men went over the top, the advance being made painfully and hesitantly by the aid of compass bearing because the thick mist had obliterated all known landmarks. Montfaucon was stormed and taken in the morning hours, but the assault was stopped in the afternoon, the attackers nevertheless working slowly toward Septsarges. Cuisy was captured, and the main effort was thenceforward directed at the capture of Septsarges. West of that village the Americans were met by heavy German reinforcements, and the men dug in on a line which approximated the objective of the corps for that day. 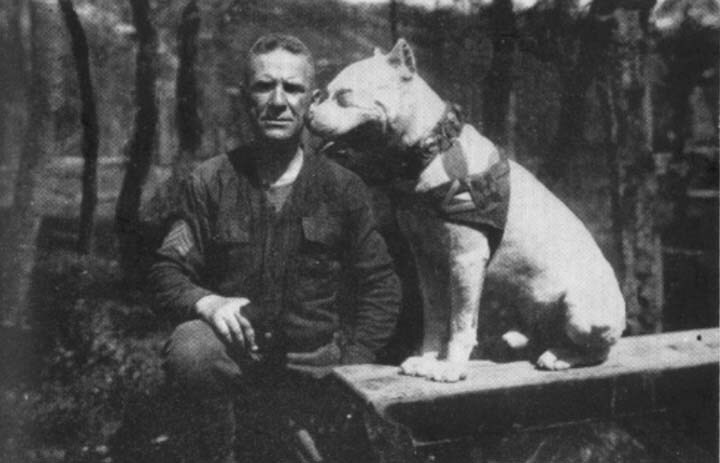 The 1st Army Corps, commanded by Major General Hunter Liggett, took Vauquois and got well into the Argonne Forest in the first day's fighting. Our corps, the 3rd Army Corps, commanded by Major General Robert L. Bullard, took the Forges Brook sector. The 5th Army Corps, under Major General George H. Cameron, was held up and could not take Montfaucon until the second day's fighting. We of the 4th Division, under Major General John L. Hines, probably could have reached the Kriemhilde Stellung had it not been for Foch's policy of limited objectives which held us back. Experienced observers believed that we might have reached the objective set for the entire 1st Army: the northern edge of the Bois de Forêt --- an operation that subsequently required 15 days and cost 6,000 lives. In Pershing's Field Order No. 27, issued on September 28, may be found a trace of disgust at the cautious expedients of Foch: "3. The 3rd, 5th and 1st Corps will advance within their zones of action as specified in Field Orders No. 20, without regard to objectives." Meanwhile, in Eastern France, the British general, Rawlinson, won a signal victory over the enemy. On September 29 he unleashed on a 9-mile front a mammoth offensive marked by a 56-hour preparatory barrage from 1,600 field guns (one every 3 yards), including an 8-hour drenching of the enemy with poison gas. His troops splintered the Hindenburg line and even rolled on beyond the rear zone of that system. On the same morning, Bulgaria signed an armistice with the Allies. The two blows evidently shook Ludendorff to his heels, for Captain Liddell Hart wrote that "In the afternoon Ludendorff, at Spa, studied the problem in his room at the Hôtel Britannique --- an ominously-named choice of headquarters! Examination only seemed to make it more insoluble, and in a rising outburst of fear and passion he bemoaned his troubles and berated all those whom be regarded as having thwarted his efforts --- the jealous Staffs, the defeatist Reichstag, the too humanitarian Kaiser, and the submarine-obsessed Navy. Gradually he worked himself into a frenzy, until suddenly, with foam on his lips, he fell to the floor in a fit. And that evening it was a physically as well as a morally shaken man who took the precipitate decision to appeal for an armistice. . . ."
His decision, as we know now, resulted in the appeal of the imperial German Government to President Wilson on October 3. But we of the armies knew nothing of such negotiations, even though most people in France knew of the German appeal by October 5. The statesmen knew that the battle could not be fought much longer; the men did not. Ludendorff and Hindenburg both realized at this time that the Allies could not be defeated, yet thousands of men on both sides had to die in agony and misery before the several governments of Europe could make up their minds to a cessation. of warfare. More than a month of terrible bloodshed and death was to spin itself out before the German envoys of a discredited government would slip through French lines to meet Foch at Rethondes in the forest of Compiègne. Headquarters of the 4th Division had been established with much difficulty at Cuisy on the night of September 26-27. Major General Hines, our commander, found it necessary to sleep on a pile of wood in one corner of a wet, smoke-filled hut. At 6:30 on the morning of the 27th the attack was renewed, but the efforts were largely forestalled by the enemy, who was desperately moving in considerable numbers of reserves. Our men had been held back too long by Foch's commands. On the 29th of September the Germans had no less than 9 divisions in the line. Drizzling rain began to fall on the 28th, so that the roads back of our lines were turned into quaking bogs. Communications were tangled, supplies were delayed in arriving, and little progress was being made in the advance. The region in which we found ourselves had been shelled incessantly for four years, and what once had been roads were now in many instances nothing but deep-ploughed gullies or ditches, brimming with water and liquid mud. The 4th Engineers had to construct 3 miles of roads back of our lines, and they had to work at night. Forty thousand sandbags were used, and when they had been exhausted, stones from shattered houses or public buildings were used. At Malancourt our engineers used the stones of the village church, and even a few from the community's graveyard. Nevertheless, the Americans had reached (but not penetrated) the Kriemhilde sector of the Hindenburg line, in one of the most heavily fortified regions of the entire European front, and the enemy was quailing. On October 1, after the first American break-through, the commander of the 5th German Army Corps, Lieutenant-General Georg von der Marwitz, said to his men: ". . . . The heaviest part of the task will thus fall on the V Army . . . in the coming weeks, and the safety of the Fatherland will be in its hands. It is on the firm resistance of the Verdun front that depends the fate of a great part of the Western Front, perhaps even of our nation . . . . "
And Paul von Hindenburg, in his memoirs, wrote of this stage of the Meuse-Argonne offensive: "It was plain that this situation could not last. Our armies were too weak and too tired. Moreover, the pressure which the American masses were putting on our most sensitive point in the region of the Meuse was too strong." My own experiences during this part of the Meuse-Argonne campaign were not pleasant. 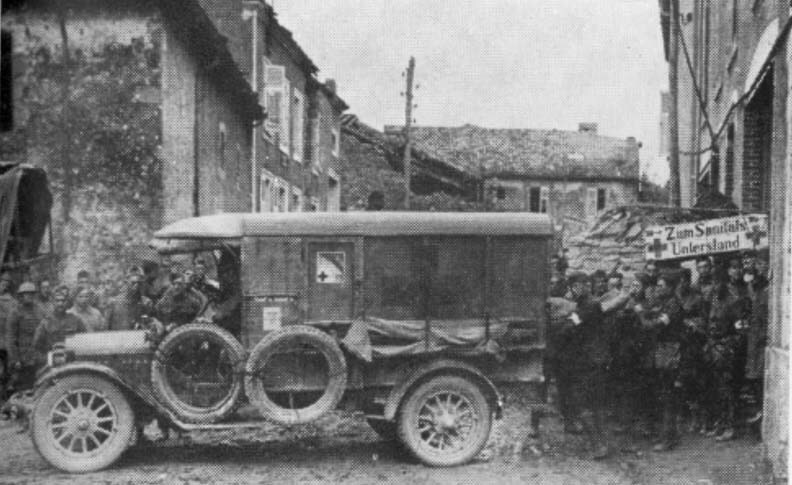 The ambulance companies, at the beginning of the campaign, had moved to Cuisy, which was still being sprayed by German machine gun fire and occasional burst of shell. We set out for the village, reaching it about 1 o'clock one dark, rainy Sunday morning, finding it filled with American soldiers, most of whom were either lost or fast becoming so. Anxious cries of "Hey buddy; what's your outfit?" rang out intermittently in the gloom and mist. I remember that I walked up to a colonel of infantry, not recognizing the eagles on his shoulder straps, and asked him peremptorily what his outfit was. He was good natured enough to give me a civil answer. On September 30 I went to the village of Septsarges, only recently wrested from the Germans, to establish a field hospital. I reached the town at about 3 o'clock in the afternoon, finding 60 or 70 wounded soldiers who had been moved to a small wooden hut about 60 feet in length in a woods near the village, by litter bearers and battalion surgeons. The structure had been built by the Germans out of branches of trees; and appeared to have been a barracks. The wounded Americans lay on double-deck bunks made by the Germans. They ought to have been evacuated, but could not be taken out because of the flooded roads. I had 4 sergeants and 40 men with me and we faced a task more trying than any we had had before. Those of us who could not sleep in the makeshift hospital building slept in foxholes or burrows in the earth, while the rain beat down steadily. Our ambulances could not get into the woods surrounding this hut, that we used as a field hospital, so the injured men had to be carried on stretchers for several kilometers before the ambulances could be reached. 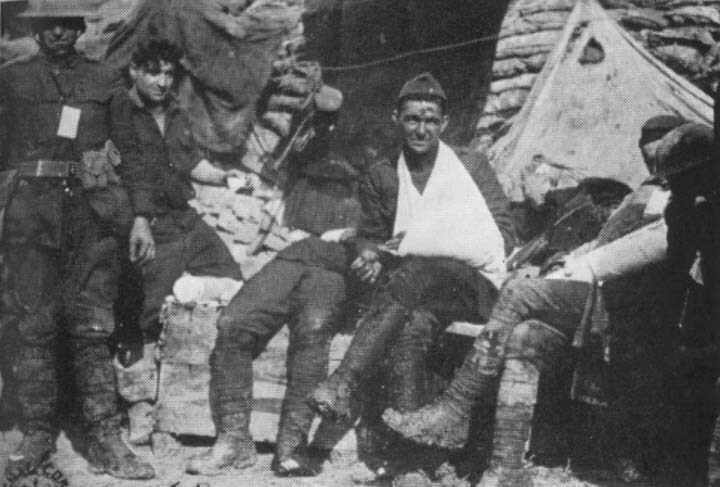 On the second day we managed to take out about half of the most seriously wounded, and on the third day we evacuated half of those who remained. On the next day we took out nearly all who had remained, and for several days thereafter we conducted a dressing station at this hand-made cabin. 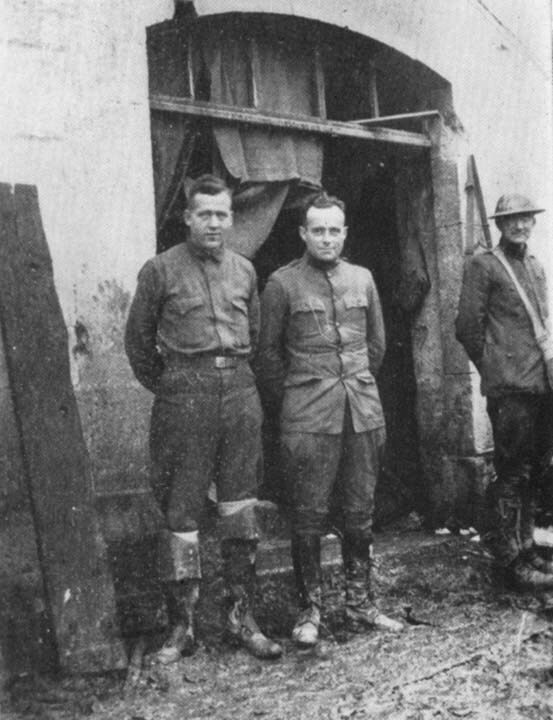 Lieutenant Coughlin and I also established a dressing station in the village of Septsarges. We found a shell-shattered building that once had been three stories high. It had been built on the slope of a steep hill, so that the front of the building faced the street, and was one floor lower than the rear elevation (see frontispiece). We were thus provided with good shelter from artillery fire, barring a direct hit. Wounded men were brought to this cellar-like place from the battlefield, their wounds were dressed and they were installed in ambulances for the trip back to a base hospital. The machines could get no closer to the front than this station. For several days I took litter-bearers and went up to various battalions ahead, taking out the wounded and bringing them back to our station. The firing would vary from mild shelling to severe barrages. On some days we would find many casualties, but on other days only a few would be brought back. Most of the time I spent the evening hours in sleeping next to the wounded men, but ready for call at any hour, as if I were practicing medicine somewhere in the United States. We stayed at Septsarges for about two weeks, and much of our discomfort was ameliorated by the splendid work of a man whom we called "Colonel" Martin. He was a worker with the Red Cross, and it was said that before the war he was a professor of romance languages at Stanford University in California. He had a flimsy, chattering Ford truck which he cajoled or bullied to Paris at regular intervals, magnificently oblivious to shot and shell or poison gas. The colonel's return to our battered retreat was the occasion for great jubilation by all hands, for he never failed to bring us chocolate, candy, cigarettes, tobacco, and a few old newspapers or magazines and an English canteen filled with whiskey. We were thus able to give the wounded men hot chocolate and warm blankets, and we took great care to dry their uniforms for them before they were hauled to the rear. We had trouble with stragglers. They knew our station was about as safe from shell fire as any place in the vicinity, and they came in with outrageous tales and wholly imaginary maladies. Many times we had to drive such fellows away. There were similar men in every army, and the American forces probably had no more than any other organization. One night, after we had dropped down to the floor to sleep, a soldier stumbled in. Only a candle was burning, and in the flickering light I thought the man was a straggler seeking a safe cove. I was about to order him out of the room when he told me that he had been shot. He seemed to be irate about his injury, and then I perceived that he limped. I had placed him in a chair and had started to remove his clothing, when he unstrapped the leather holster containing his service pistol. "Here, take this, Captain," he said, "I will have no further need of it. Keep it for a souvenir." The man had a machine gun bullet lodged in his thigh, yet be had walked more than a mile to reach our station. As we talked he told me that he was from Oklahoma, and that he had joined a replacement division. He objected strenuously to being evacuated, saying that he had left his home in the States only a short while before and was already wounded without seeing as much action as he had hoped to see. I had to argue with him for some time before I could get him to agree to climb into an ambulance. I accepted his pistol and took it back to America with me. On one occasion we moved our dressing station about a quarter of a mile closer to the front. It was situated in the same woods as the former station, in a building that had been built by the Germans out of branches of trees. It happened that the afternoon was quiet, and we had only two or three men to care for at the station, so we sat about talking idly to each other. Suddenly there was a tremendous explosion about 30 feet from our station, and we saw a great fountain of earth and débris leap up into the air. When the dust and smoke cleared, we began to hear shouts for help, and then we saw the prostrate form of a soldier on the ground. We rushed out with litters and learned that the soldier had suffered a compound fracture of the lower leg. He was suffering terribly, and begged for something to deaden the pain. My first thought was: "This is one time we can give a man every possible assistance at our command because we have so few wounded to look after." A new man, unused to our routine, was standing near, and I told him to hand me a hypodermic syringe containing one-quarter grain of morphine in solution. I injected this solution and then ordered that the stricken man be brought to the station. I was particularly anxious to control this soldier's pain, and I waited for about 10 minutes before attempting to dress his wound and to apply a Thomas splint. To my surprise, his pain was not lessened by the injection, so I asked for another syringe containing one-quarter grain of morphine in solution. He received this injection, and we waited for the narcotic to take effect. But the man lay there in obvious pain, pate and restless. Finally he said to me: "Lieutenant, I simply can't lie still any longer --- I am so jittery and the pain is getting worse." I looked at him in amazement. I had never encountered anything like this in either medical school or hospital; it was almost beyond belief. The soldier had received one-half grain of morphine and yet was suffering more pain than when we first saw him. Incredulous, I questioned the man who had been in charge of the syringe. To my horror, I learned that both syringes had contained one-thirtieth of a grain of strychnine instead of one-fourth of a grain of morphine! The poor fellow had thus received a total of one-fifteenth of a grain of strychnine. Fearful that he would go into the characteristic convulsions of strychnine poisoning, I at once injected one-half grain of morphine in solution. In a few minutes his pain was lessened enough for us to dress his wound and to apply a splint. I sent him to a field hospital and waited anxiously for reports concerning his condition. Later I learned that he had come to no harm as a result of our blunder, but I must confess that our burning zeal to give this one soldier the finest medical care we could muster almost came to tragedy. In Berlin, as we know now, the Social Democrats in the Reichstag were clamoring for the restitution of Belgium, liberation by the Germans of all territories still occupied, and abandonment of the Treaties of Brest-Litovsk and Bucharest. Mutinies sprang up among the sailors at Kiel and Wilhelmshaven when their commanders ordered them out to the North Sea on a last desperate foray against the British fleet, and in Berlin the aged chancellor of the Imperial German Government, Count Georg von Hertling, first Catholic minister-president of Prussia since the Reformation, resigned on September 30. Prince Max of Baden, already ill from the initial effects of an attack of influenza that was to send him to his bed within a few days, became the last chancellor that the Hohenzollern regime in Germany ever had. Pershing set about the work of reorganizing the American Expeditionary Forces in preparation for a fiercer offensive than the one we had experienced at St. Mihiel or even the first battles of the Meuse-Argonne. The first phase of the Meuse-Argonne was over. Before this campaign should end, American soldiers would plunge themselves into some of the most desperate fighting of any American military campaign since the epic battles of Cold Harbor and the Wilderness. OF THE GERMAN MILITARY MACHINE POISED uncertainly against the Allies at this time the distinguished British authority, A. F. Pollard, professor of history in the University of London, has written: "The wonder is not that the machine broke down, but that it bore so great a strain for so prolonged a time. The Germans could not command successes because they defied the conscience of mankind, but from the military point of view they certainly deserved it." Professor Pollard continued: "In spite of Ludendorff's attempt, natural in a Junker to debit revolution with his failure, it was American reinforcements which turned the scale." Generalissimo Foch, returning from Flanders on October 1, had remarked that Pershing's plan of pushing in more American troops "only intensified the difficulties, and resulted in a complete block of his [Pershing's] rear and the bottling up of his communications." Foch therefore sent Major General Maxime Weygand to Pershing with the request that the American troops proper be diverted eastward astride the Meuse, so that a new French commander could achieve control of the Franco-American armies on either side of the Argonne Forest. Pershing refused this undisguised demand for assimilation of the American forces, and was so emphatic in his refusal that the Frenchman subsequently ordered that "the American attack should be resumed, and, once started, continued without pause . . . . ."
Yet Foch did not cease complaining of the results of the early part of the Meuse-Argonne campaign, saying that they were "inferior to what it was permissible to expect against an adversary assailed everywhere and resisting at certain points with only worn-out, heterogenous and hastily assembled troops, and in a region where his defensive positions had already been captured." The old tiger of France, Georges Clemenceau, on a visit to Foch at this time, said rather savagely that "Those Americans will lose us our chance of a big victory before winter. They are all tangled up with themselves." Pétain even went so far as to draft a report to Clemenceau, which Foch would not allow him to send, concluding: "If General Pershing perseveres in his present line of conduct, it can only end in disaster." Pershing's reply was a dogged silence. He reorganized his troops, placing Hunter Liggett in command of the First American Army, and installing Robert Lee Bullard as commander of the inactive divisions in a unit called the Second American Army. This action served to make Pershing an army group commander, so that he was enabled to demand that he receive his instructions directly from Foch, instead of through Pétain, as had been the procedure before. On the 14th of October the grand Allied attack swung into action near the French and Belgian seaboards. The Germans crumpled steadily. They evacuated the Belgian seacoast at once, falling back to a position marked by a line running through Ghent. They lost the city of Lille to the British on October 17, and on the same day they faded back before the fury of Haig's smashing attack at Le Cateau, where the celebrated anatomist, Wilhelm His, had done such excellent investigative work for the medical section of the Imperial German Army. On the 12th of October I went up to the Bois de Forêt. Captain Arthur J. McCarey, now a physician in practice at Green Bay, Wisconsin, took me part of the way in a Dodge touring car. I walked the rest of the way, uncertain of where I was going or how to reach the place. I had received orders to go to the sector to remove wounded men known to be lying there without assistance. The approach was exceedingly difficult. Stumbling along through the mud, I finally became so confused that I would have sworn that I was hopelessly lost in that miserable, water-drenched country until, quite by accident, I happened upon a telephone wire that had been laid only a short time before by our Signal Corps. I traced out this wire for about a mile and a half, trudging north of the road that lay between the villages of Brieulles and Cunel. The scenes I saw as I walked along were sickening. Scores of American dead lay where they had been struck; some, as I judged, had been killed only a few hours earlier, since they still clutched rifles in their lifeless hands, and some of the bodies were still warm. I could not but reflect that the ordinary private soldier's part in the mammoth struggle raging from Switzerland to the sea was infinitesimal indeed; that at best he could do no more than guess at the reasons for his being in arms against men he had never seen or known, men of whose motives he knew nothing and whose faces he in all probability would never behold; that the soldier who twenty years before had been a happy, whistling farmer lad or a sturdy product of the cities or mountains certainly had suffered a malign throw of the dice if he had lived his brief span merely to have his life gutted away in a filthy mudhole in a land whose tongue he could not even understand. Dressing station at Les Eparges; France, in 1918. "In the Bois de Fays, near Brieulles on the Meuse, the 4th Division held a scattered line of holes in rain and cold, amid shattered tree trunks. There was mud, gas, attack from three sides, shell-fire, counter-attack, cold food if any, the stench of dead bodies, continuous horror. In one spot, 60, dead, in another 200 . . . . Three desperate attacks finally took the 4th Division northward well out of the stink and mire of Bois de Fays into a salient which included a larger wood (Bois de Forêt) nearer the Meuse. And here shells from somewhere in the rear fell on men seventeen days strained by high explosive, gas, machine-guns and snipers, and here the 4th Division fell back until that shelling ceased, then regained. their positions." I had brought no litter-bearers with me, so I pressed two German prisoners into service, directing them to carry the one man who could not walk. But destruction stalked us on the return trip. The enemy began to shell the woods as we left the place, and when we moved out of the cover of the trees and reached an open slope the cannonading became furious. Shrieking missiles hurtled by us, and we fell to the ground for refuge again and again. We could hear too plainly the impacts of shells as they buried themselves in the earth with angry roars, and we could see vast fountains of mud and débris which leaped high up into the air as the projectiles burst on the slope. It was at this time that I met Major Harrison Briggs Webster, who was working his way cautiously up the incline to rejoin his battalion, of which he was surgeon. He made some jocular remark about the intense shelling, laughed, and walked on toward the woods. He could not have gone far before he was instantly killed by a German shell. A handsome officer only thirty-four years old, he was a graduate of the Harvard Medical School and had begun his career in the World War by joining Ambulance Company No. 14 at Fort Benjamin Harrison, Indiana. I was one of the last men to see him alive. When at last we reached the bottom of the slope, I called for a rest period, during which I engaged the two German prisoners in a makeshift conversation. We could not say much, because I knew only a little German and the two prisoners knew scarcely more English. But I had resolved to obtain something from the men as a souvenir, and as I was about to cut off a button from one of the men's tunic, be reached into his pocket, drew forth a large knife and handed it to me. One of the prisoners then began to object to the practice of American physicians' carrying pistols while they wore Red Cross brassards on their sleeves. To carry a pistol and at the same time invoke the protection of the brassard was, he said, a violation of the "Geneva rule of war," as he called it. In theory the German was correct. Medical officers and certain men in the Medical Corps were supposed to wear the Red Cross brassards and did wear them. On the other hand, the American Army table of organization did specify that some of the ambulance company officers and men were to carry pistols. Probably the Red Cross brassard was abused in this manner in every army that fought in the World War. Wilhelm His, the Swiss anatomist who discovered and first described the conduction system of the heart, writing in his book of reminiscences of the World War called Die Front der Artze, said: "I succeeded in getting what I had failed to obtain in Berlin --- a Browning pistol. In Berlin they had been entirely sold out. It looked very martial at the belt but the front sight was wrongly placed, so that shots went terribly wide. I never made use of it." I never carried my pistol while the World War was being fought. Later, in Germany with the American Army of Occupation, the personnel of our ambulance companies was required to do guard duty; that is, the enlisted men served as guards and we officers became officers of the day. When I served as officer of the day in Germany I carried a pistol, but it was never loaded. I was much more afraid of shooting myself with the weapon then I was of the need of using it against the Germans. As it happened, I do not recall an incident of the war in which I could have used a firearm. As we continued toward the rear from the Bois de Forêt, we passed a field in which we noticed a company of American infantrymen at rest. An officer walked up to me to ask, "What's up there ahead?" Somewhat shocked at the thought that these soldiers were lost, and might easily have opened fire as I came toward them with two Germans in uniform, I managed to tell the officer that the 59th Infantry was up in the woods from which I had come. It was plain that the officer did not know where he was, and if he had mistaken me for a German officer, I might not be alive today. When we finally returned to the dressing station several days later, Captain McCarey rushed up, seized my hand and threw his arms about me, saying that he had not expected to see me again. This made me realize that I had been subjected to much greater hazards than I had realized at the time, but my own expectations when I set out had not been so gloomy. I had adopted the fatalist's view, that if I were hit, I would be hit, and there would be nothing more to it. But I also had calculated that there would be plenty of room for shells to burst without hitting me; in the words of the philosophical colored man, "To hit where I ain't." Many times I was genuinely afraid, but if I had allowed my mind to dwell on the possibility of death, I soon would have been unfit for military service or anything else. Too many men suffered from just such a type of neurosis, and I had seen too many of them to leave myself a prey to worry. When, however, I began to check the wounded men I had brought back I stared in astonishment. I had left the Bois de Forêt with more than a score of injured soldiers, but now I had only seven or eight! I do not know what became of the missing men. The only solution is a ghastly one: I suspect that some of the wounded had been blown to bits while we lay breathless against the earth on the hill during the veritable hail of shells that fell among us when we emerged from the woods. But we may at least hope that a few of them eventually regained enough strength to work their way back to a dressing station where they would be safe. When the offensive started on September 26, the 4th Division had occupied a front that extended from Haucourt on the left to Bethincourt on the right. To our left was the 79th Division and to our right was the 80th Division, both American. But at the time of which I write, the 4th Division had advanced to a front extending from the Bois de Fays on the left to the shattered village of Brieulles on the right. The division was withdrawn from active service on October 19, and from that time until the 11th of November functioned as a reserve unit, outside the zone of battle. Our division had no less than four different commanders during the month of October. Major General John L. Hines left us on the 10th to become commander of the 3rd Army Corps. He was succeeded by Major General George H. Cameron, who had commanded the luckless 5th Army Corps in its fruitless assault at the beginning of the Meuse-Argonne campaign. General Cameron stayed with us only until October 22, and he was succeeded by Brigadier General Benjamin A. Poore. On the 31st of October General Poore re- turned to his brigade in our division and Major General Mark L. Hersey became the divisional commander. The division moved to Vignot, a small village north of Commercy, on the 21st of October, although it is obvious that all units of so great a body of men as an infantry division could not all reach the same spot on the same date. As a rule, the most vital units reached the point of bivouac first, and the others arrived somewhat later. We had been assigned to the 2nd American Army commanded by General Ballard on the day we went out of active service, which was October 20. As the month ended, the headquarters of the division were at Lucey, in the vicinity of Toul. One afternoon in October I was standing on a low hill, talking to some litter-bearers, when a German airplane suddenly appeared from nowhere and swooped down low over a hillside that lay on the other side of the ravine, about 300 yards to the rear of my position. Three observation balloons had been run aloft on that hillside. Visibility on that day was so bad that the aviator easily reached the first balloon before our anti-aircraft guns could open fire. The German dived down; engine roaring, straight for the first balloon, the vicious clatter of his machine gun plainly audible to us as he ripped the big bag full of holes. Gouts of black smoke broke out in little puffs on the smooth surface of the balloon, and then the whole carcass seemed to burst into one great flame. Meanwhile, some infantrymen had opened fire from the ground with their rifles, and finally the anti-aircraft guns began to bark. The observer who had occupied the first balloon was floating to the ground in his parachute; the man in the second balloon dropped over the side of his basket only a few seconds later. The German airman wheeled back again in a huge arc, sending streams of hot bullets into the second balloon. It, too, burst into flames and black smoke, the burning basket and gear settling slowly to the earth. The ground crew, in the meantime, had been working frantically to get the third balloon down before the aviator could get his sights levelled at it. As they hauled it to within a few feet of the ground, the German dived down once more, straight for the unwieldy bag amidst a storm of rifle bullets and anti-aircraft shells. All his bullets went wide, so he zoomed upward and made off toward the heavy clouds from which he had come. Scarcely three minutes had passed since he first appeared, yet he had managed to shoot down two of three observation balloons, of which the American forces had all too few, as General Pershing testified in his memoirs. On another afternoon while we were at rest we happened to notice a lone airplane that was flying very high above us. We thought we could distinguish it as a German craft, and since the day was clear and sunny, with only a few scattered thunderclouds on the horizon, we watched the solitary speck in the sky with great interest, wondering what its mission might be and what would happen to it if Allied aviators discovered it. Soon three airplanes bearing the familiar circular insignia of the Allies came into view, flying very fast. They were obviously in pursuit of the German. We suddenly sensed that we were watching a life-and-death combat that was going on high in the heavens above, and every one of us stared fixedly at the sight, oblivious to anything on the ground. We saw that the German aviator was hopelessly trapped and that he would have to resort to whatever bag of tricks he might have to escape the three who were harrying him. With the Allied machine above him, the German went into a tailspin, dropping almost straight downward like a dead leaf from the tree in autumn. Then he righted his plane and roared upward in a beautiful arc, paused, and toppled downward into that screaming tailspin again. One of the Allied airplanes, evidently American, crept slowly up to the German and engaged him without hesitation, spurting bullets time and again into the twisting, swerving, rocketing enemy craft. Both aviators were now drumming their machine guns at each other at every opportunity, and for a time neither appeared to us to have any advantage over the other. Suddenly a great sheet of flame and smoke leaped up from the fuselage of the German airplane and the machine seemed to waver, then topple helplessly on its side into an aimless, spiral descent to the earth, a yellow train of fire streaming out behind it like the fiery rail of a comet. It struck the earth not far from us in a shuddering crash, but we were surprised to see the observer crawl from the airplane, leap through the smoldering mass of wreckage in safety and take to cover. The pilot was stone dead. We were supposed to remain hidden during the daylight hours, but literally hundreds of soldiers swarmed over the field to the wreckage. Soon the small American airplane glided down and taxied up to where we stood in a big ring around the foundered German airplane. The American flyer jumped down from his machine and ran up to the German observer, who had reappeared. "This fellow is my meat!" we heard him exclaim. A little later a dun-colored Cadillac touring car rolled up, and the American and the German climbed into the tonneau and were driven away in fine style. Apparently, the aviators had a code of their own, and also somewhat more luxurious perquisites of position than those which we enjoyed. During this period of inactivity behind the sector of battle I came to understand why the Marines have gained such a reputation as tough, relentless and tempestuous fighters. One of our regiments was commanded by a colonel who previously had commanded a company of Marines in the Battle of Belleau Woods. It was the same officer who, in the St. Mihiel offensive, had castigated a younger and subordinate officer who had eaten before making sure that his own men had been given their food, as previously described. A more blustering, quick-tempered, glowering man I have never seen. He customarily filled the air about him with red-hot profanity, and he bellowed like a bull if things were not to his fancy, but he was a most efficient commander and enjoyed the respect of his men, who no doubt secretly admired his bluff mannerisms and his choleric temperament, particularly since they realized that he was constantly alert for their welfare. I had hauled a young YMCA worker in my ambulance for several miles, in spite of orders to the contrary. 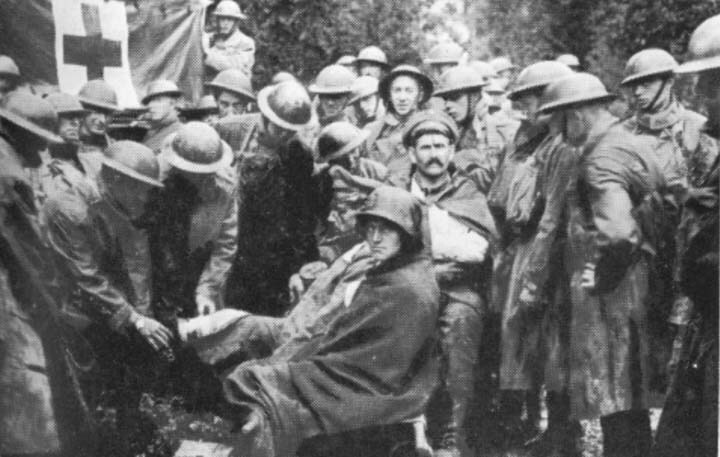 We were not supposed to transport anyone in our machines excepting wounded men and our own personnel, but we sometimes winked at the regulations and took pity on weary and footsore soldiers whom we met on the road. This YMCA worker, however, was not deserving of much consideration, to my mind. He had not been at the front; rather, he had been working in what we all took to be a rest area, and he had therefore experienced very little or no danger. He incessantly referred to the rest area as "up front," in spite of the fact that there was not a German for miles around. The colonel and the men in general did not take kindly to this man, or indeed, to YMCA workers and similar noncombatant followers. Efficient as such persons might be, admirable as their motives might be, a soldier's first reaction when he met such an individual would be, "Why in hell isn't that able-bodied fellow in uniform, where he could do some real good?" Possibly that reaction was not justified, but it was perfectly natural. Soldiers who had only recently returned from the real sector of fighting, where they had seen their comrades shot down like trapped rats or blown to bits before their eyes, could not be expected to look kindly on healthy men who in the peace and quiet of the areas outside the front lines were performing tasks not absolutely essential to the conduct of the war, and who at the same time were being credited with being in the thick of combat when they were actually working in absolute safety. Soldiers seemed to complain less of Red Cross workers than of other noncombatants. I think nearly everyone appreciated the work the Red Cross men did, although those of the Red Cross were not, as a rule, exposed to much danger. One of the brigades of the 4th Division had received orders to go back to the front, and I had made my way to the officers' mess of one of the regiments for a meal. As we sat around in a small hut that bad been taken for a mess hall, the colonel looked about him and demanded testily; "Where in hell is Pale-Face?" No one knew exactly who "Pale-Face" might be, but I guessed that it was the YMCA worker, and I screwed up enough courage to tell the former Marine that the fellow had gone to Paris for a rest. "Rest, hell!" roared the colonel. "By God, if I catch him around this outfit again, I'll break every bone in his body!" But the tempest was not spent. As we began to eat, the colonel looked down at his plate and we saw a too-familiar purplish tinge suffuse his face. He had ordered a beefsteak, which was to have been smothered in onions, but he could see very few onions on the meat before him. He glared at the Filipino orderly who had brought him the plate. The frightened Filipino levelled a trembling finger at the paltry array of onions on the steak. "Why, you slant-eyed son of Belial!" bellowed the apoplectic officer, "take that steak out and bring it back with some onions on it or I'll kill you? I'll kill you; do you hear me?" The quaking little brown man skittered out with the steak like a flash, speechless with terror. If there were onions to be found for fifty miles around, it would have been a good wager that he found them, somehow. On the 3rd of November the division received a most discouraging order. The 8th Brigade, the 39th Infantry Regiment, the 11th Machine Gun Battalion and part of the 4th Sanitary Train were to return to the battle sector. The rest of the division was to remain where it was until additional orders were issued. The men were extremely disconsolate. No one knew much about the fighting at the front, but everyone hoped that the Germans had been so battered that the 4th Division would not have to go forward again. By no means was cowardice involved, for there was no talk of balking at orders and no one complained. Men simply did not enjoy the prospect of facing bullets and shells again after the comparative ease and security of the rest area. But before all the men could be moved, orders were dispatched to General Hersey which revoked the previous command to advance, and we did not venture forth. Our ambulance company was stationed at Ville d'Essey on the Meuse. Nothing of much importance happened while we were there. We realized that the enemy was in retreat, but we did not know anything about his condition, save what we were told by various men who came back to the rear from time to time. On the 10th of November conflicting stories began to circulate. We heard that an armistice with the Central Powers had been signed, and we also heard that it had not been signed, but that it probably would be signed the next day. On the 11th, early in the morning, our company received orders to proceed to the front. It was a dull, cloudy day, and as we drove forward we could hear church bells tolling in an adjoining village at about 11 o'clock. The sound meant nothing to us, for we had been ordered to go forward, and we had to obey. As we rolled along we thought about what lay before us. We knew that we had been very lucky in experiencing all the horrors that lay behind, and emerging without mishap, but now we were genuinely afraid that we would be killed, possibly after an armistice had been signed. So we talked very little, and jolted along until we thought we were reaching the front. At noon we saw the sun appear from behind the clouds, and the day became fair and clear. At noon we had a good dinner, bolstered by wine and champagne to celebrate an armistice that we fervently hoped had been signed, and to spur on our drooping spirits. After the meal I climbed into an ambulance and sat on a seat in the rear, not caring greatly where the driver took me. After an hour's trip over the rough roads I still felt much depressed, but I took care not to let the men know my state of mind. At about sundown we arrived in the woods to which we had been ordered, and we slept in tents without ceremony. Captain Dobbins and I occupied the same tent, and we remarked on the odd circumstance that although the night was clear and cold, so that far-off sounds ought to have reached us easily, we heard not one shot all night long. We were sure, then, that an armistice had been signed, for we knew we were far enough advanced to hear the accustomed sounds of battle if battle indeed was being carried on. On the next morning it was still cold, and the aroma of hot coffee brought us out of the blankets on the run. Ten minutes later we were whooping and dancing with joy, for a courier had reached us with orders that we were to retrace our way, and return to the small village we had left the day before. The journey to the rear seemed enormously easier than the same journey forward had been. We swung along on foot in fine style, reaching Ville d'Essey at about 5 o'clock in the afternoon. That excellent Scotchman who was governor-general of Canada, the late John Buchan, wrote in Days to Remember (with Percy Newbolt) that when the news of the Armistice reached the men "suddenly, as the watch-hands touched 11, there came a second of expectant silence, and then a curious, rippling sound which observers, far behind the front, likened to the noise of a great wind. It was the sound of men cheering from the Vosges to the sea." Perhaps it was that way. But the memory I have of the Armistice concerns a cold, frosty night in a lonely woods, spent in a deathly silence which was the more oppressive because I feared that the next day I would have to venture forth once again into murder and destruction. We heard no cheers, no guns, no celebrations. Not until the coming day did we realize that the armies of the world had at last laid down arms that had been wielded unceasingly for four long years. It is interesting, almost 25 years after that momentous day, to reflect on the emotions of others in the service when they heard of the signing of the Armistice--- Robert Maynard Hutchins, now president of the University of Chicago, was then an 18-year-old soldier in the United States Ambulance Service in Italy, where he won the Croce de Guerra of that nation. He heard the news as he was walking into an Army base hospital at Vicenza, a victim of jaundice. All he wanted was a good rest in bed. The well-known playwright, Lawrence Stallings, then a captain of Marines, was lying in bed at Base Hospital No. 27 at Angers, France. He thought that the preoccupation of a soldier with his wounds probably overshadowed every other consideration at the moment, even that of the end of the war. Darryl F. Zanuck, the motion picture producer, was an enlisted soldier 16 years old, serving with the 37th Division in Belgium. He was happy when he heard the news, but was also disappointed because, to his youthful mind, it meant the end of a great experience. The actor, Adolphe Menjou, was captain of an ambulance company in the 5th Division. The Tennessee hero, Sergeant Alvin C. York. who won the Congressional Medal of Honor for capturing 128 Germans and 5 officers near Chatel-Chehery, France, on October 8, 1918, was at a rest camp at Aix-le-Bains, his division, the 82nd, having been relieved on November 1 after spending 20 days in the front lines. York had been in the rest camp for about 3 days, and reported that when he heard the news, all he could think of was to get back to his home in Tennessee. Brigadier General Charles G. Dawes, commissioned a major of engineers in June of 1917 and later appointed chairman of the General Purchasing Board of the American Expeditionary Forces, was in Paris when the Armistice was signed. He wrote in his book, Journal of the Great War, "I could not cheer to save my life, but I have to try hard all the time to keep from crying." Alexander Woollcott, an enlisted man and one of the editors of the famous AEF newspaper, The Stars and Stripes, had slept on the night of November 10 in the cellar of an old house in Romagne on Montfaucon hill, not a stone's throw from where our dressing station had been, in the vicinity of Cunel and Brieulles. On the morning of the 11th he was walking along a battered road with the late William Slavens McNutt, when a company of replacement soldiers came into view. Woollcott called out to a sergeant that the war would be over at 11 o'clock in the morning. The beaming sergeant yelled back at him, "What time is it now?" Hanford MacNider, former assistant secretary of war and minister to Canada, was a major in the 2nd Division stationed at Mouzon on the Meuse. On the morning of November 11 he was trying to put 2,000 American soldiers across the river to take the bridgehead on the other side, the maneuver being intended to give the Americans an advantage in the event that the Armistice was not signed. So thick were German machine gun nests that Major MacNider thought such an attempt by his soldiers would be murder. Knowing that the command, "Cease fire!" was only a few hours distant, he disobeyed his orders and called his men back, an act of insubordination that saved hundreds of lives that otherwise would have been snuffed out for no good reason at all. The greatest array of generals in history. Allied generals lined up at ceremonies which made General Pétain a Marshal of France, at Metz on December 8, 1918. Left to right; Joffre, Foch, Haig, Pershing, Gillain of Belgium, Albricci of Italy, and Haller of Poland. Pétain stands in front. Behind, between Haig and Pershing is General Maxime Weygand, a figure also in the present World War. The novelist John Dos Passos was a sergeant in the Medical Corps, in charge of a kitchen on board the S. S. Celtic, bound for Europe, when he learned of the signing of the Armistice. His immediate reaction to the news was to concoct a choice English stew for himself, but he was disappointed in not being able to return to the front, where he had been an ambulance driver. Of all the accounts I have read of that fateful morning in 1918, only the one of the actor, Victor McLaglen, reveals emotions similar to mine at the news of the Armistice. McLaglen was chief of the British military police in Bagdad at the time. He wrote that he could not realize that the vast struggle was really ended. "When you've been geared to a thing for four years," he said, "you can't suddenly quit thinking along certain lines any more than you can stop on a dime after driving 60 miles an hour." That, in substance, was what I felt. Not for days afterward did I grasp the full import of the end of the struggle. What the end of the war meant to those splendid veterans of the British and French armies who had seen so much blood and death and who had been at the front so much longer than I, can only be imagined. After 22 years of incessant bickering and debate, it does not now seem wise to inquire into the real reasons for the triumph of the Allied armies. Certainly it would be nothing less than rank folly to assert that America won the war for the Allies, as some jingoistic politicians and professional flag-wavers have so vociferously asserted. Much the most temperate and considered evaluation that I have read concerning the Allied victory is one written by the British authority, Captain B. H. Liddell Hart: "Controversy has long raged as to what was the deciding act of the conflict, what were the causes of victory, and, even less profitably, which country won the war. If it be accepted that the mind of the enemy's ruling power is the ultimate target, aimed at indirectly through the bodies of their troops and their civil foundations, then, so far as any military act was decisive, the memoirs of Ludendorff reveal that it was the attack of August 8 reinforced by the overthrow of Bulgaria. But if these would have ensured peace it is most improbable that Germany would have accepted the conditions ultimately secured. "The truth is that no one act, still less one cause, was, or could be, decisive. The western front, the Balkan front, the tank, the blockade and propaganda have all been claimed as the cause of victory. All claims are justified; none is wholly right. In the new warfare between nations victory is a cumulative effect to which all weapons---military, economic, and psychological--- contribute. Victory comes, and can only come, through the utilization and combination of all the resources existing in a modern nation, and the dividend of success depends on the way in which these manifold activities are co-ordinated. It is even more futile to ask which country won the War. France did not win the War, but unless she had held the fort while the forces of Britain were preparing and those of America still a dream the release of civilization from this nightmare of militarism would have been impossible. Britain did not win the War, but without her command of the sea, her financial support and her army to take over the main burden from 1916 onwards, defeat would have been inevitable. The United States did not win the War, but without their economic aid to ease the strain, without the arrival of their troops to relieve considerable parts of the Allied forces --- freeing them for offensive us above all, without the moral tonic which their coming gave, victory would have been impossible. And let us not forget how many times Russia had sacrificed herself to save the Allies; preparing the way for their ultimate victory as surely as for her downfall. Finally, however we may judge her motives, let us pay tribute to the incomparable endurance and skill with which Germany more than held her own for four years against superior numbers, an epic of military achievement." To those who, in the passing of the years have forgotten the terrific toll in flesh and blood exacted by this struggle, or to those who were at the time too young to appreciate the tremendous slaughter, the accompanying tables, compiled by Colonel Leonard P. Ayres of the General Staff, are addressed.